I was very skeptical when I first made Isa’s Chickpea Cutlets from her website the Post Punk Kitchen. I thought cutlets made from chickpeas? How weird. But man, was I wrong! I made a few changes to Isa’s recipe to fit our diet. In the end, my version doesn’t quite look like hers. But that’s okay. I think it’s because I don’t use vital wheat gluten. I was nervous because I read through the recipe and comments and it seemed the recipe had to have vital wheat gluten. My HyVee carries it, but it is made in a facility that also processes milk. Can’t do it. Not safe. So, I crossed my fingers and subbed plain ole unbleached white flour. And I made my own breadcrumbs from our frozen bread ends. I swapped the soy sauce for liquid aminos. And I’m just not a thyme girl. I kind of HATE it. I used poultry seasoning instead of thyme. The recipe called for sage and sage and poultry seasoning just go together in my mind. It worked! As a matter of fact, these cutlets are AMAZING! They have become a family favorite. These are also super budget friendly!!! I purchased my jarred glass of Randall’s Garbanzo beans for just 99 cents. We get 2-3 meals out of each cutlet batch. That’s 33 cents to 50 cents for our protein per meal. Our grocery budget needs a little breathing room, and these cutlets provide that. 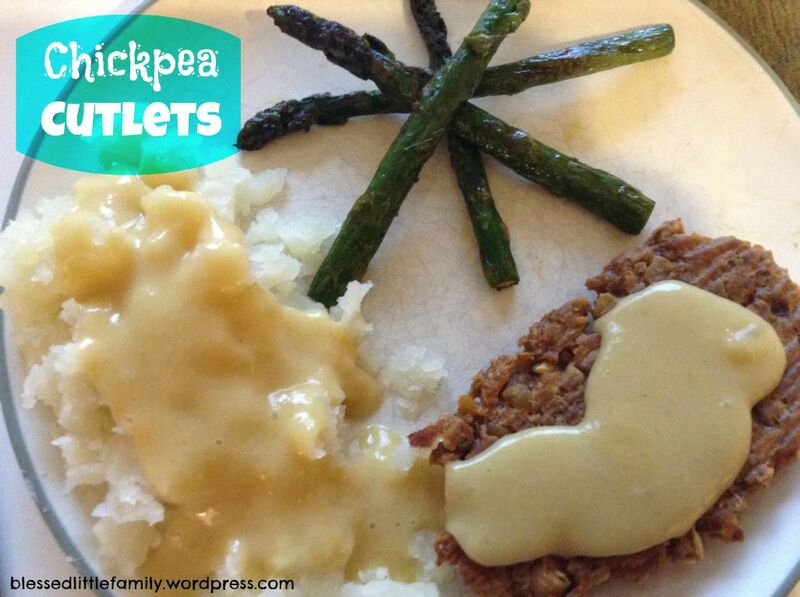 I have found an amazing vegetarian gravy recipe that pares well with this recipe. I use vegan butter and liquid aminos in this gravy recipe. I also use an immersion blender to blend the onions in the gravy and make it smooth and creamy. My 4 year old has no idea there are onions in her favorite gravy. She doesn’t like onions. Hehehe!!! Click here to see the gravy recipe. I’ve also discovered these cutlets make an excellent “Cutlets Parmesan.” That post is in the works. For now, here’s how I make my new favorite food, chickpea cutlets. If you use store bought breadcrumbs, skip to step three. If not, start with making homemade breadcrumbs. I usually use frozen ends of bread I keep in the freezer for just this purpose. Set the oven to Broil on High. I use 4 slices of bread. Watch them closely. The bread will burn quickly if let in too long. By too long, I mean 2 minutes on one side. I usually set a timer for 60 seconds. Check. If crisp enough, turn bread and set timer again for the other side. If the bread isn’t crispy enough, set timer for 20-30 second intervals. Once the bread is crisped enough, rip them into about four pieces each and put in a small food processor. Put all four slices in and grind and chop until the bread turns into breadcrumbs. This should make just over a cup. Measure out the cup you need and put it into a bowl. Add the flour, poultry seasoning, paprika and sage to the breadcrumbs and give it a good stir with a fork to spread the spices. If using store bought breadcrumbs, don’t forget to add them in this step. Use the same small food processor to grind up your fresh garlic. If using minced garlic, you can add it to the food processor with your chickpeas. Add the rinsed chickpeas to the food processor. I pulse it continually until it looks like tiny chickpea rocks. I hope that makes sense! Add the chickpea and garlic mixture to the dry ingredients in the bowl. Add the olive oil, vegetable broth and liquid aminos and stir with a fork. Use your hands to knead the mixture in the bowl a little bit. I do it for maybe 30-60 seconds. 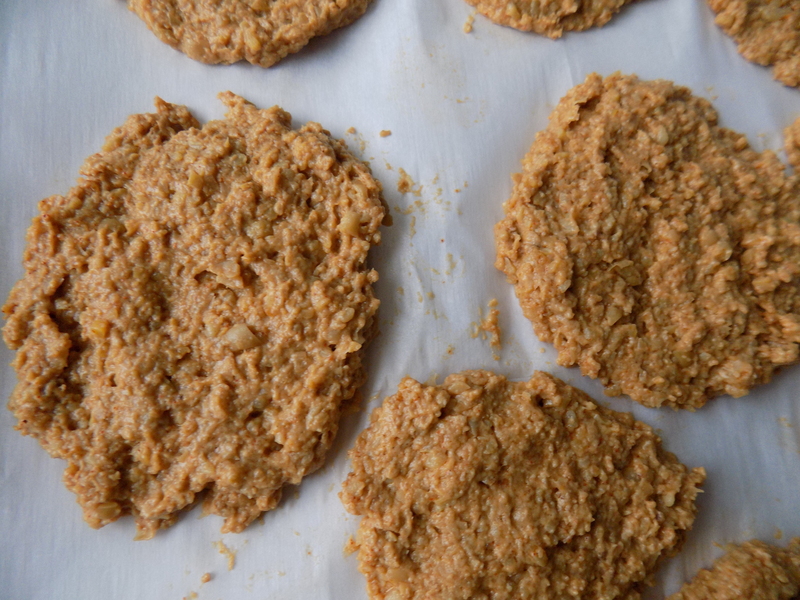 You need a cookie sheet lined with parchment paper for this next step. 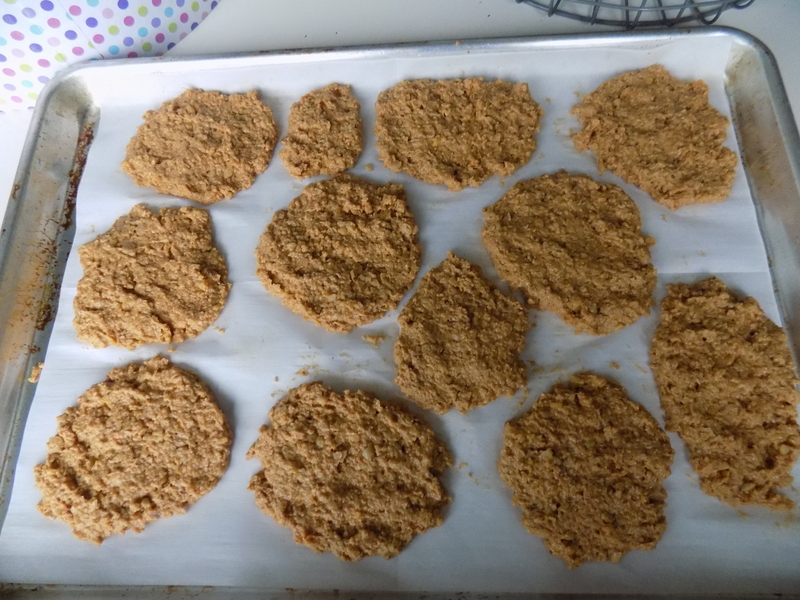 I take blobs of the cutlet mixture and spread them out with my fingers into circle shapes. I try for a school cafeteria chicken patty shape. 🙂 The mixture is very sticky and doughy. But it all comes together in the end. Bake for 30 minutes, flipping the cutlets once after 15 minutes. Uncooked Cutlets. I usually get 11-12 of these per batch. 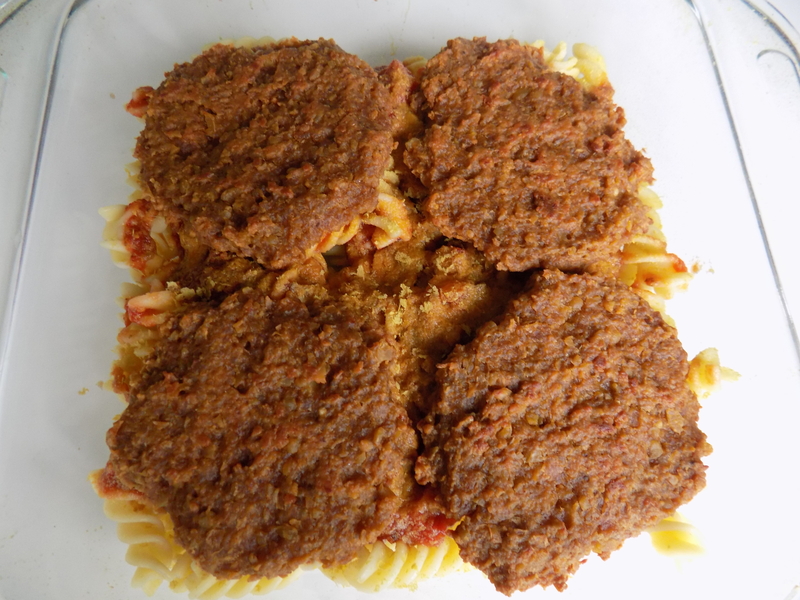 Here’s what my cutlets look like cooked on top of the noodles for “Cutlets Parmesan.” I’ll share that recipe in the future. Cooked Chickpea Cutlets in my Cutlet Parmesan recipe. I forgot to take a close up pic of just the cutlets. Sorry y’all! The Huzz also thinks these will make great sammies. As soon as I buy some lettuce, we want to try these as sandwiches with lettuce, tomato and onions. Mmmm! Can’t wait. These also freeze beautifully. I love having these babies ready to go in the freezer. It makes me happy. Happy is good. And we certainly LOVE these! We hope you love these cutlets, too. Do you freeze them raw or cook then freeze? I cook them first then freeze them. I love having these ready to go in my freezer!